Article publié le Sunday 1 November 2015. Fourteen years ago I went to Exeter to see Jenny Sealey’s signed staging of The Changeling. I still recall the scene between Beatrice and De Flores when the appalled realisation dawns on both of them that they have misunderstood the other’s intention: she suddenly understands that he doesn’t want her money but her body; he twigs that she sees him merely as a paid assassin, not as a potential lover. What made it so vivid was the signing, which added layer upon layer to the drama, multiplying the gaps between the way we interpret language and misconstrue intention. The signing wasn’t a distraction, it was a bonus that added to our understanding of the drama, whether we could hear the text or not. That was a long time ago, but we’re finally seeing more artists, deaf or not, understand the creative potential of signing on stage. 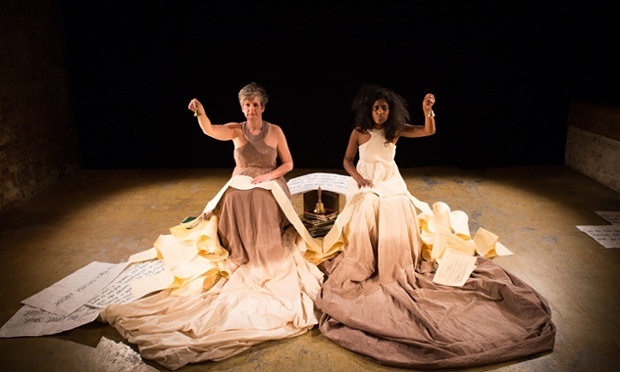 At Edinburgh this summer the signing by Catherine King in My Son and Heir was as much an element of the performance as any of the text or other visuals. It felt entirely integrated. It might feel odd, now, to see the show without it.